File photo of Commencement Fall 2014. 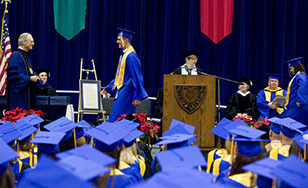 The College will conduct its fall 2015 commencement at noon Saturday, Dec. 19, in the Reif Gymnasium on campus. It will be a combined baccalaureate, master's and doctoral ceremony with 534 candidates for graduation. A total of 318 bachelor's degrees, 154 master's degrees, and 50 doctoral degrees will be awarded, along with 12 certificates. Prior to commencement, there will be a 9 a.m. Mass ceremony in Our Lady Queen of Peace Chapel on campus, followed by a graduation brunch in Somers Lounge from 10 a.m. to 11:30 a.m. The commencement address will be given by Robert Ryan, Trustee Emeritus. Ryan is the founder, president and owner of Odyssey Development and Odyssey Resorts, and has been involved in many vacation home developments and private residential communities across Minnesota. A student address will be given by James Glogowski, class of 2015. Music will be provided by the Duluth Scottish Heritage Pipers and the American Indian Wolf Clan Drum Group. Mezzo soprano and 2015 graduate Antonia Ross will sing "When You Believe." The St. Scholastica Alumni Association will host a reception for graduates and their guests after the ceremony in Storm's Den in Tower Hall.